Sakai Guides and DocumentationSakai Complete User Guide ForumsHow do I reply to a forum post (i.e. conversation)? Choose a topic within a forum. Click on the title of the topic to enter the topic. Note: The message indicator text next to the topic title will tell you how many messages have been posted within that topic, and how many of them are new or unread. Click on the title of an existing post to view the conversation. 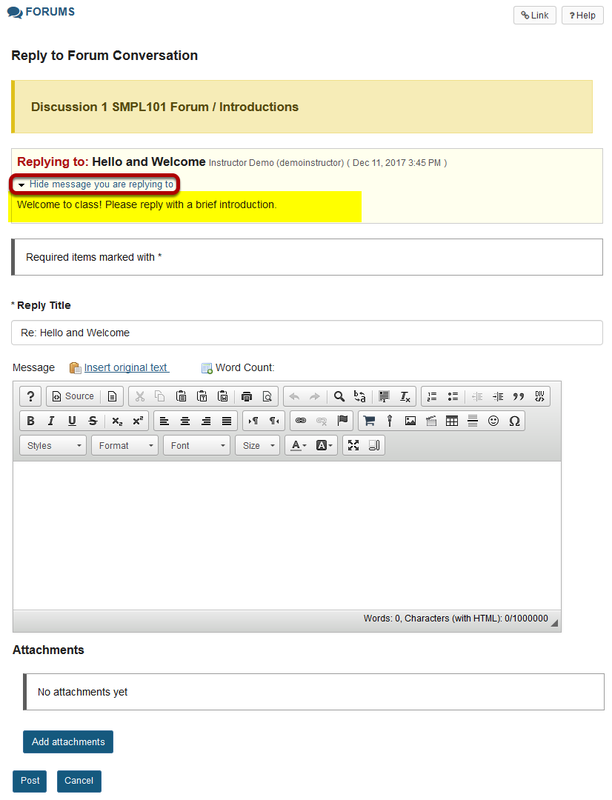 You have two different options for replying to the post within the Forums tool. Click Reply to Initial Message at the top of the conversation to reply to the first message in the conversation or thread. Click the Reply link within the message itself to reply to the item you are currently viewing. This is the option you want to use if you would like to reply to someone else's reply. The message you are replying to will be displayed at the top. You can hide the message by clicking on the small downward arrow next to "Hide the message you are replying to". The title will be taken from the initial message and prefilled for you, but you may modify it if you wish. 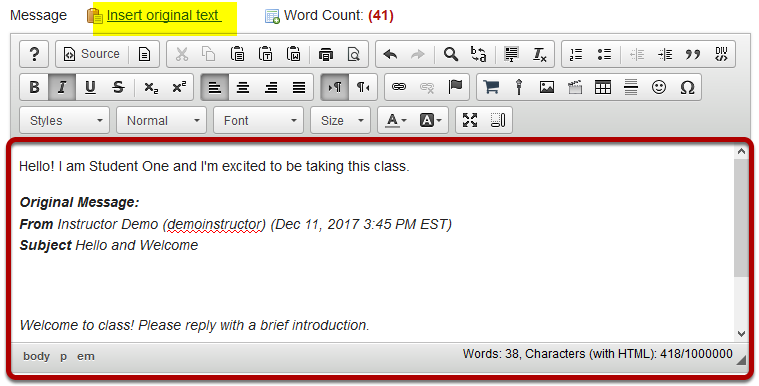 Use the Rich Text Editor to compose your response. Note: You may optionally click on the Insert original text link above the editor area to include the original message along with your reply. Click the Add attachments button if you would like to browse for and attach a file. After you have finished your reply, click Post to add your message to the conversation. Prev: How do I post to a forum topic? Next: How do I email a forum post author?